I guess Taryn’s dad has faced a minotaur before. Has Tony always had that necklace? I think he was just shooting at Tony because he was with Chase. He doesn’t seem like he would miss anything. The next most fearsome creature- Angry fiance? Man the look on Chase’s face when Tony gets shot is just outstanding. waaaaiiiiiit…..where’d he get a spear? Fine, Ill just assume he fashioned it from a stick, some rocks, and some residual manliness emanating from Taryn’s Dad in the meantime. Chase’s face in the second panel gave me the giggles. Real!Tony’s gonna be pissed again, isn’t he? Thank’s for bringing back Tony’s rapper medallion. It’s everything I hopped it would be and more. But i still like chase with at least smaller eyes, panels 2 and 3 are my favorite for his eyes. Also, if Mr. Mills doesn’t miss, and Tony didn’t die, then what was the intent of that bullet? 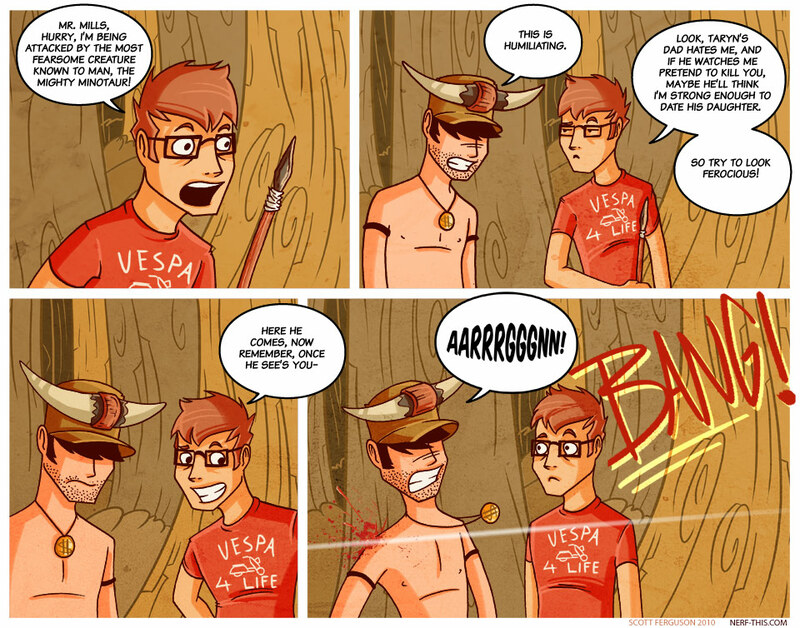 Chase’s face on the last panel is amazing and I will treasure it forever. I think that in third panel “see’s” ought to be “sees”. I don’t know how the comments work, or how you edit, but I thought I’d point it out if you wanted to change it.